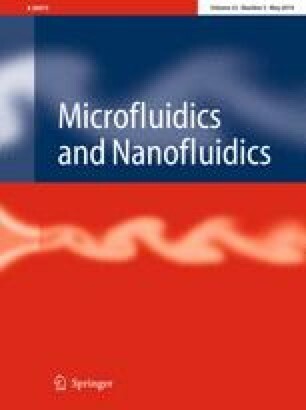 In this work, the dynamics of bubble formation in a highly viscous liquid in a co-flowing microfluidic device is experimentally investigated. The evolution of gaseous thread in the co-flowing device is recorded using a high-speed camera. The bubble formation process can be divided into three stages: retraction stage, expansion stage, and collapse stage. According to an analysis of the forces acting on the gaseous thread, the bubble formation in the co-flowing device is a competitive result of the surface tension, pressure difference and shearing effects. The surface tension effect plays an important role in the retraction stage. In the expansion stage, the pressure difference effect dominates the bubble’s growth. While in the collapse stage, the shearing effect leads to the interface breakup. Three empirical correlations are proposed according to the experimental data and can be used to predict bubble formation frequency, the diameter and length of the generated bubbles. This work was supported by the National Natural Science Foundation of China (Grant nos. 11672284 and 11602266) and the National Key R&D Program of China (Grant no. 2017YFB0603701).